A perusal of the serial number/model record cards, held by NA Graphics, revealed that Vandercook & Sons exported presses via multiple foreign firms beginning in the late 1920s through the 1960s. 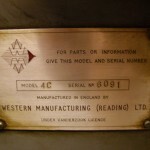 Most of them are listed in adverts found in The Inland Printer as well as The British Printer. This data is complied on the Vandercook Dealers page. 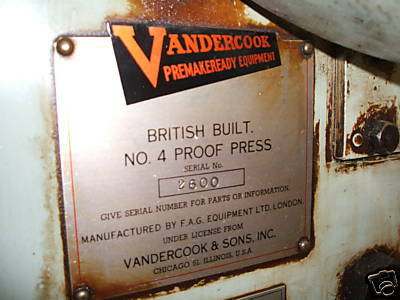 A later, separate initiative licensing the manufacture of Vandercooks in Great Britain began in the later 1940s or early 1950s. 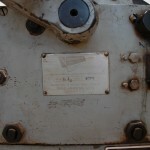 A number of photos provided by press owners in the UK, Australia, New Zealand, and Israel show nameplates stating the licensee. These models differ in cabinet and feed board style from Chicago-built presses, but appear to have the same trip mechanism and inking system. To date, four firms are represented: Hunter-Penrose Ltd. (later Hunter-Penrose-Littlejohn), FAG Equipment Ltd. (the London subsidiary of the Swiss press maker), Pre-Press Ltd. and Western Manufacturing. 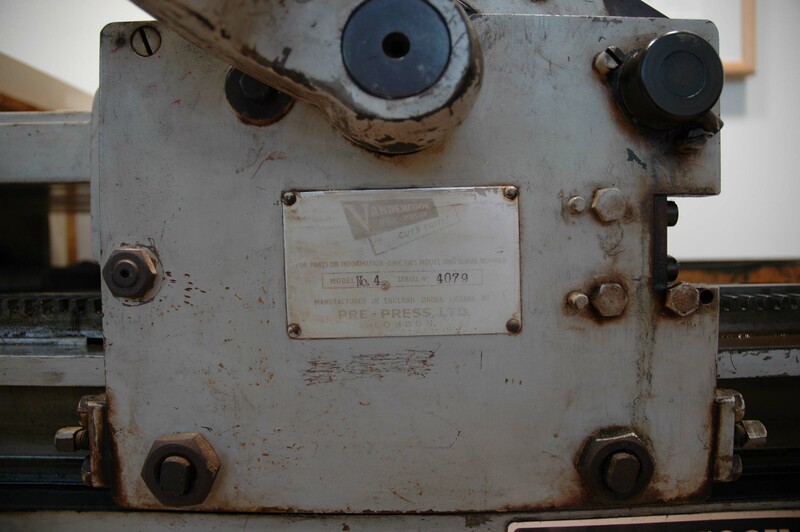 Each of these licensees used serial number ranges separate from Chicago-built presses. While no Vandercook company documents concerning licensing have been found, it is likely that these agreements superseded one another rather than being simultaneously in effect. 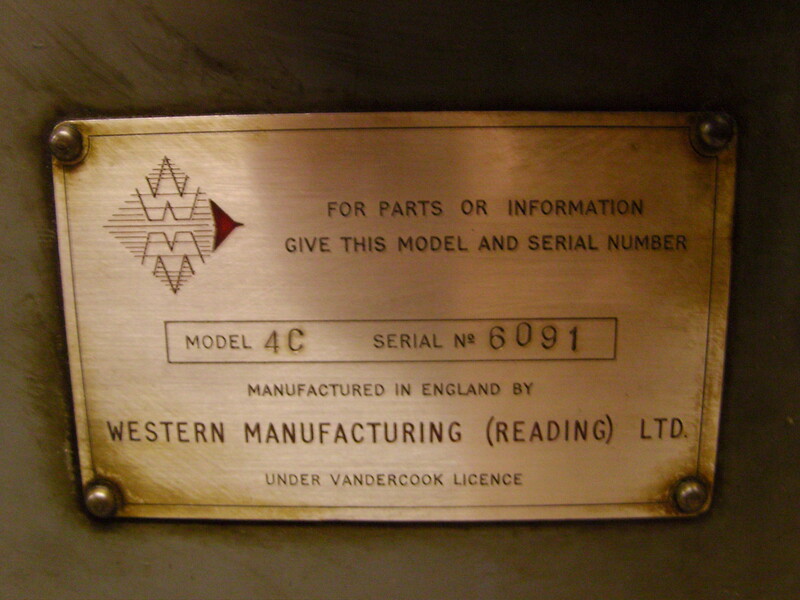 However, two print references mention British manufacturing: the monograph Story of A Visit to the New Vandercook Plant (1954) and an article on Western Manufacturing/Pre-Press Ltd. in The British Printer (July 1960). British Printer adverts also show that Hunter-Penrose-Littlejohn and Western Manufacturing produced presses independent of Vandercook. It is also widely known that in Switzerland FAG produced a range of hand-cranked and power carriage models. See the Other Brands page For more info. Thanks to Edward Denovan for providing me the BP article and a photo of his press’s nameplate, and to Alistair Wooton and Donald Kerr for their photos. 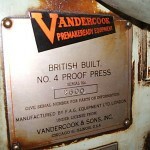 Just to add to your post Paul, Vandercook also exported directly through Soldans Ltd – the original importer of my sp-15 which has a Chicago nameplate. Yes, Soldan is included in the Importers table on the Vandercook Dealers page.